Seasons greetings from @lace_fire! 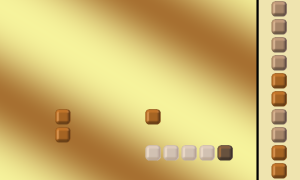 For November’s #1GAM, I decided to create a different take on one of my favorite simple games, Snake! For my version, I wanted to make the snake candy-based (probably due to the abundance of sweets I eat during the holiday time-frame) and had to keep the graphics relatively simple due to my learning the basics of Blender alongside the creation of my game. All graphics were created using Blender and GIMP, other than the win screen which was a mixture of Microsoft Word and Paint. The music/sound effects were composed with Musink. This entry was posted in Game Development, Indie by lace_fire. Bookmark the permalink.